In the industrial arena, this metal is used for electrical applications including electric motors or electromagnets. 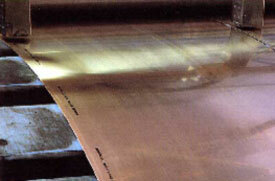 A good deal of copper plate is used for roofing. Because of it's heat transferring properties it is also used for the manufacture of pots and pans. Because of it's color copper plate is also used in architectural design. This metal form is also used utilized for electrical, mechanical, tooling, equipment, marine, copper condenser and heat transfer applications. Available Gauges: .250" to 12"
Available Widths: 12"/ 24"/ 36"/ 48"/ 60"/ 72" depending on alloy required. Available Lengths: 96"/ 120"/ 144" or custom cut to your requirements. Available Surface Condition: Mill Finish or custom stain or mirror polished with PVC.